Unlike cleaning smooth leather boots, suede has it’s own set of rules when it comes to proper boot care. Suede, nubuck and roughout have a nappy texture that can be ruined by regular leather cleaners which means you’ll have to give them a little extra special attention to keep them looking clean and feeling great. In this boot care guide we will be showing you how to clean suede boots at home in an easy to follow tutorial. We’ll also go over the difference in care for each so that you can keep your suede, nubuck and roughout boots looking better and lasting longer. Suede is especially sensitive to water, dirt and salt and should be routinely cleaned and cared for to prevent unsightly damage and stains. With this in mind, it’s a good idea to do a light cleaning every 10 wears and a thorough cleaning whenever your boots are visibly dirty or develop a stain. The supplies needed for cleaning suede, nubuck or roughout are going to be different than your average leather boot cleaning supplies. Suede's nap is delicate and can be easily ruined by heavy creams, oils and solvents. 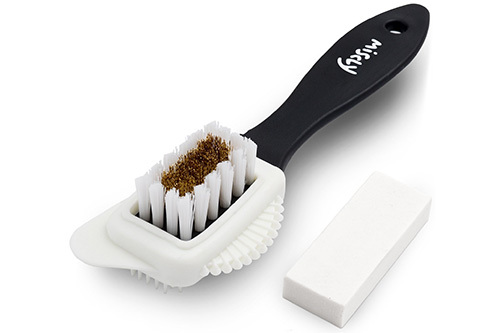 A suede brush and eraser are two suede cleaning essentials. Make sure the brush you use is especially made for suede or nubuck as other brushes may be too rough and can ruin the nap. You are also going to need a suede eraser to address stains. Purchasing a suede boot cleaning kit is recommended as it will include everything you need to get started. Sometimes a suede brush and cleaning block won't be enough to get rid of tough stains. In these cases you'll want to use a cleaning solution especially made for suede, nubuck and roughout. A suede protector spray is optional but highly recommend. After you clean your boots you are going to want to protect them from water and staining. A coat of suede protector is the easiest way to do this. The first step in cleaning your suede boots is to brush off any loose dirt, dust or grime from the nap. It’s important that you use a dry brush for this without any water or solution. With suede it’s very important that you only brush in the direction of the nap. Brushing against the nap or in circles can ruin the suede. Using a suede brush is usually enough to remove most dirt that’s stuck on the surface of the nap. Suede is a delicate leather and it’s important to not brush too aggressively. The harder the bristles on your brush, the more carefully you should apply pressure. Nubuck and roughout leather is more forgiving when it comes to brushing. You can get away with brushing in circles with gentle pressure to remove dirt, grime and dust that is stuck on the nap. For more difficult dirt spots or stains you can use a suede cleaning block or “eraser” to remove them. A cleaning block is safe to use on suede, nubuck and roughout. It works great on dry stains and will help return the nap that has flattened and developed a sheen. At the end of this step your suede boots should be dirt and stain free. For most people the cleaning process will end here and they can skip to Step 4. But sometimes there are stubborn stains and marks on your suede, nubuck or roughout that need special attention. This is when liquid suede cleaners should be introduced. For a deep cleaning you are going to want to use a suede cleaning solution. Suede cleaners usually come in two varieties: a foaming solution and a spray. Foaming solutions work like a shampoo and lathers the suede for brushing. The lather allows deep penetration into the nap to release dirt, remove stains, and revive the color. Most suede foaming cleaners come in small concentrated bottles that need to be diluted in water. 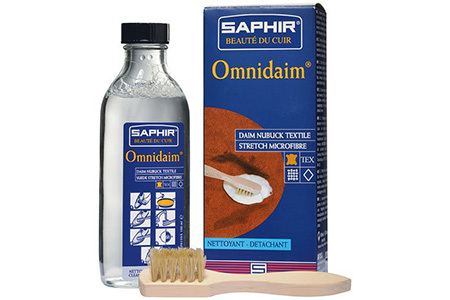 We recommend Saphir Omnidaim Suede Cleaner as it’s safe to use on suede, nubuck and textile fabrics. After you are finished cleaning your boots you have the option of offering extra protection from future staining by applying a layer of suede protector. Before you apply any suede protector you want to make sure your boots are completely clean and dry. Spray a small inconspicuous spot on your boots to make sure the protector plays well with your particular suede, nubuck or roughout. Unlike with smooth leather boots, suede, nubuck and roughout will be ruined by leather conditioners in the form of waxes and boot oils. This is why you’ll most often see suede and nubuck protector’s come in the form of a spray bottle. We recommend a few brands for suede protection. For the very best we recommend Saphir Renovateur Suede & Nubuck Conditioning Spray. Thanks to it’s special almond oil formula it’s one of the only suede waterproofing sprays that also conditions. If Saphir Renovator is out of your budget, Simple Shine Premium Water & Stain Repellent is a good alternative. 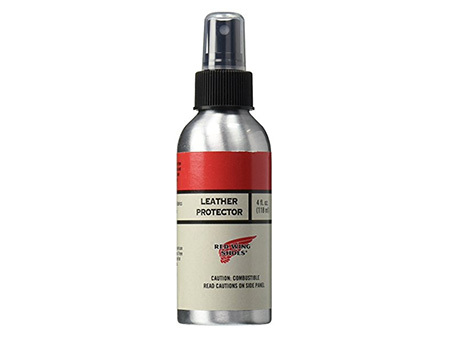 For roughout leather boots Red Wing makes a leather protector spray that protects, waterproofs and restores color. The last and final step in cleaning your suede boots is to let them completely dry before wearing them again. It’s important to give your boots enough time to restore their nap and reshape. Do not expose boots to direct heat. No hair dryers or heaters. Keep boots away from direct sunlight. Sunlight can discolor and damage suede and leather. 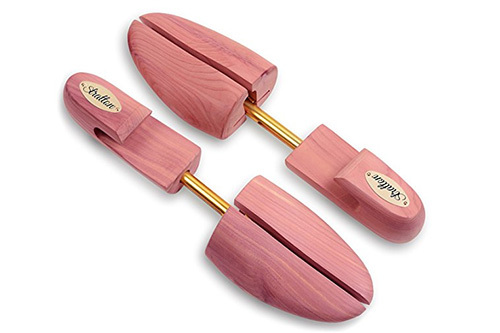 Use cedar shoe trees to aid in the drying process and reshape your boots. We recommend cedar shoe tress to aid in reshaping your boots while they dry. Not only should shoe trees be an important part of your daily boot care but they really help with the drying process. Cedar wood does two things very well: kills oder and draws out moisture. Cedar’s natural antimicrobial properties will help you boots smell as well as look better at the end of the cleaning process. You can use regular shoe trees on your boots but Red Wing does make special boot trees that perfectly fit 6 inch boots. If you can’t get your hands on cedar shoe trees then stuffing your boots with newspaper is an good alternative. So after a night on the town you discover a nasty stain on your new grey suede chelsea boots. Don't panic just yet! All you need is a little extra TLC. 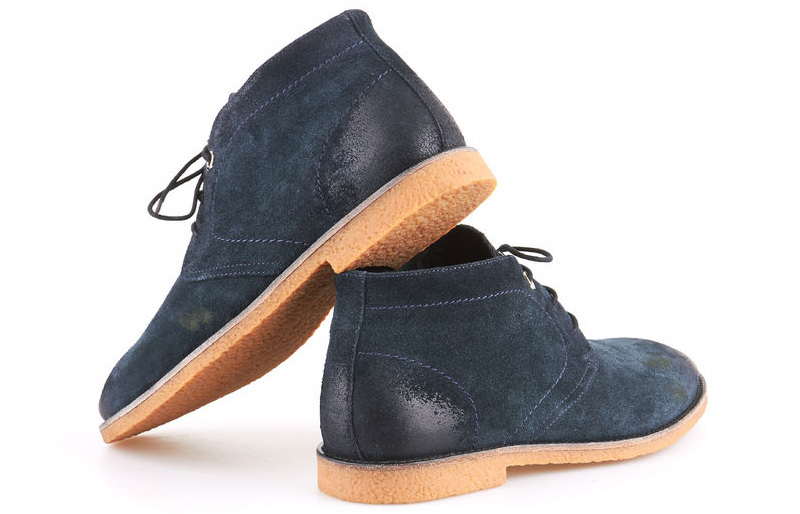 Here are some things you do to get your suede boots looking new again. Using your suede brush, apply some water to the stain and brush over the water stain. Yes, water can be used to remove water stains! Soak up excess water using a dry cloth. Dab gently until the water stain is gone. Make sure your boots are placed in a dry area away from bright sunlight or direct heat as this can cause the water to dry unevenly and worsen the stain. It is recommended that you use a shoe tree while the boots are drying so that they may retain their shape. Wipe away excess mud and then let mud dry before further cleaning. The mud will clunk up and you will be able to break off the mud once dried. You can use a butter knife to remove large chunks of mud or a toothbrush to brush off the smaller pieces. When the mud is dry proceed to clean your boots with a suede brush. If your boots are still wet from the oil stain then dab a clean towel or cloth to soak up as much of the oil as possible. Proceed to cover the oil stain with baking soda or cornstarch and let your boots sit for up to a day. The baking soda or cornstarch will absorb the oil from the suede. Once the baking soda/cornstarch is removed you can proceed to use a suede brush to restore the suede nap.